Are you and your family seeking the perfect getaway with the little ones? Why not look into a fabulous Fiji holiday with your kids? Fiji is the perfect combination of four and five star resort facilities, active excursions, relaxation and kids’ clubs. Fiji holidays are tailor made for families, especially as the Fijians are renowned for their love of children. From the minute you step out of your taxi or transfer, the little ones are taken off your hands as you are led to enjoy a cool welcome drink. Most of My Fiji’s partner resorts are equipped with a kids’ club allowing a true vacation for everyone – the children are able to play, learn local words and customs, hunt for seashells along the sandy beaches – while the adults kick back and don’t need to worry about keeping their eyes peeled on the pool to ensure everyone is safe. If your little one is too young for the kids club, it’s easy to find a mei-mei, or nanny, service in each resort, allowing parents to have time for themselves. 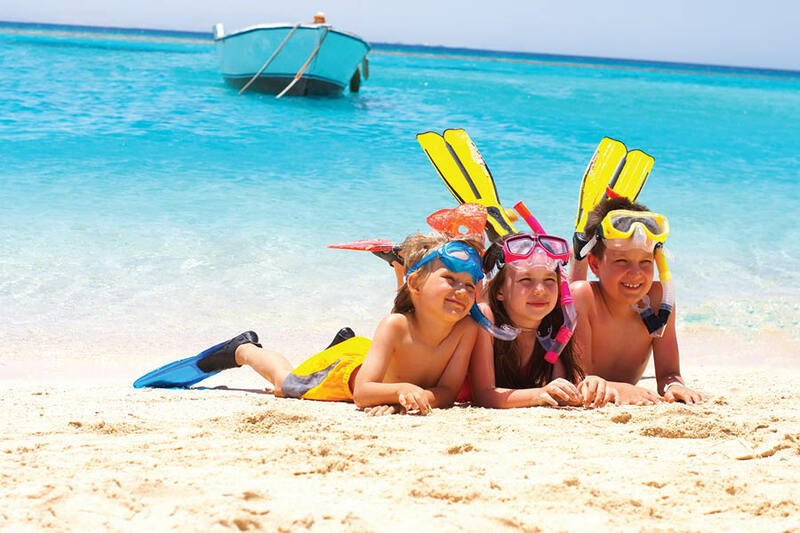 My Fiji holidays offer easy, all-in-one packages with kids, including return airfares, resort transfers, buffet breakfasts and bonus inclusions such as day cruises and free meals for children. Some of our preferred resorts, including the Sheraton Fiji, Fiji Hideaway Resort and Spa, Outrigger Fiji and Castaway are already favourites amongst families and returning visitors to Fiji, so we have taken the legwork out of booking your Fiji holidays with your kids and packaged it all up in one simple step. These resorts all offer free kids’ clubs included in the packages, as well as free meals* and daily activities to keep them busy while you take advantage of your exclusive Wine, Dine and Spa Credit with a massage or cocktail by the pool. The Fiji Hideaway Resort & Spa has a water slide in their resort pool, perfect during your Fiji holidays with the kids, and the Outrigger Fiji on the Coral Coast consistently receives rave reviews for their care of kids. If your children are too small for the complimentary kids’ clubs, many resorts – including the Outrigger Fiji – offer mei-mei, or nanny services that can be booked hourly or daily. The warmth and friendliness of the Fijian people is unparalleled within the South Pacific, making Fiji the perfect holiday escape for families with kids. Interested in doing a bit of snorkelling during your family holidays? My Fiji offers guests bonus value inclusions like day trips to the local islands, allowing the family to get a feeling for the true beauty that Fiji has to offer as they come face to face with local fish on the colourful reef! Even if you or your little ones don’t want to get in the water, the day trips offer time on almost deserted beaches, glass-bottom boat cruises for underwater viewing and plenty of food and drink at all the destinations. Castaway Island is one of the best family-friendly resorts in Fiji, with access to snorkelling sites, dive sites, surf breaks and an unbeatable kids club. My Fiji family holiday packages to Castaway include return airfares, airport transfers and the speedboat transfer to the island. Once there, all meals are included so all you need to worry about are drinks and activities not already included. Also, to ensure you and your family aren’t rushed during your Fiji holidays, My Fiji includes a couple nights on the mainland to match up with flights. Is your family larger than the average 2 adults and 2 children? Are you looking for a resort that caters to a unique meld and grouping of travellers? Maybe 3 or 4 kids? Maybe a teenager and a small child? Perhaps you only want to stay somewhere that offers self-catering facilities or offers separate living/sleeping areas to provide privacy? The My Fiji Holiday Experts are happy to work with you to find the ideal location for your holiday. For example, since most resorts allow only 2 adults and 2 children (under 13 years) in one room, sometimes it will be necessary to book two rooms. Worried that it might get too costly? Check out the Warwick Fiji on the Coral Coast, which not only has a fantastic kids’ club but is the best value when needing two rooms. Maybe you prefer something that offers more comforts of home? The Sheraton Denarau Villas offers guests 2 and 3 Bedroom Villas that can cater to as many as 6 adults and 2 children with separate bedrooms, living room, kitchen and outdoor space. What about a stay in a 1 or 2 Bedroom Suite at the Radisson Blu in Denarau? Fiji is a delightful and hassle-free place to visit for the entire family. No visas are required for Australian, New Zealand or American visitors which makes the arrival procedure fast and efficient. The flight time from the East Coast of Australia is between 3-4 hours, so maximising holiday time is easily organised and families can begin to enjoy their holidays from the minute they step off the plane. All My Fiji holidays include VIP concierge service as well as transfers, so upon arrival you know someone will be waiting with a friendly smile and cold bottle of water while you acquaint yourself and your family with your new surroundings. Fiji’s reputation precedes itself, with accolades for the friendliness of the locals and the ability to enjoy a family holiday, so contact an experienced My Fiji Holiday Expert today to make the Fiji family holiday of your dreams a reality.